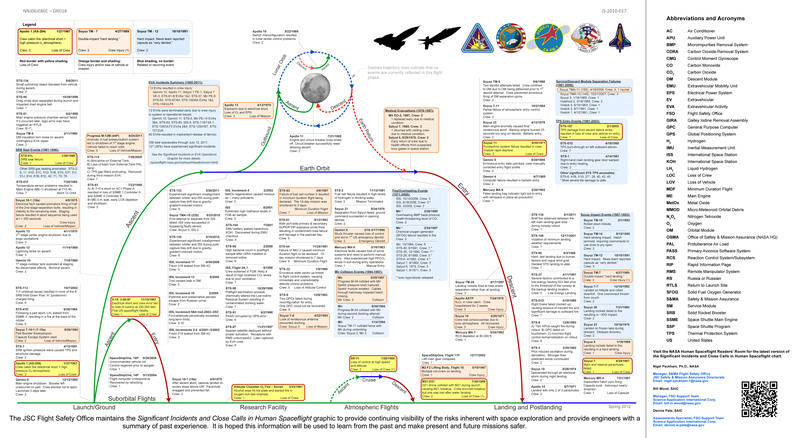 This remarkable graphic keeps track of all safety issues that have occurred from the beginning of manned spaceflight through today. The graphic is the responsibility of the Flight Safety Office at NASA’s Johnson Space Center to, as they put it “provide continuing visibility of the risks inherent with space exploration and provide engineers with a summary of past experience. It is hoped this information will be used to learn from the past and make present and future missions safer.” The latest version is always available from the NASA Human Spaceflight Readers’ Room. Interesting graphic, but it seems to only focus on the flight crew. There have been quite a few losses on the ground too. Is there a chart for that? You can easily find a list at Wikipedia. Good point, Shaun, I’ll have to look into it. Let me know if you have a favorite and I’ll see if we can get permission to post.